The first prize went to William Sowerby, owner of Coombeshead, Launceston, Cornwall. Mr Sowerby planted a three and a half acre wood on a hill crest, restoring mature trees, saving old trees from neglect, coppicing, and even planting 300 yards of mixed hedge – which now provides berries and nests to birds, while sheets of corrugated iron on the ground encourage worms and other species. The second prize went to Ben and Diana Porter, owners of Warren House in Crewkerne, Somerset. Mr and Mrs Porter bought the 14 acre wood in 1978 and breathed new life into it. The woodland now that provides wood for a walking stick business, Classic Cannes, which employs ten people and sells products in forty different countries. The judges felt this was a great example of a woodland being managed for a specific purpose, developing jobs and contributing to the local economy. John Arnold’s wood at Russells Farm, near Cullompton, Devon, was commended by the judges, who admired the work done to protect the woodlands from squirrell damage. Mr Arnold converted fifteen acres of farmland into woodland, planting a mix of native trees. The trees are now being grown for quality timber, with thinnings used to provide fuel for heating and cooking. Also commended was Simon and Sonia Hodgson’s Higher Minicleave Wood in Chumleigh, Devon. The wood has been in the family since 1952 and has benefited from continued management. It has been divided into eight compartments with trees varying in age from 80 to 140 years, providing thinnings for fencing, some wood fuel timber and timber planks. Nest boxes encourage tawny owls and pied fly catchers, while hibernation boxes give a safe habitat to dormice. The common theme running across this year’s winners is the important and varied benefits that can be derived when a wood is actively managed and preserved for future generations. 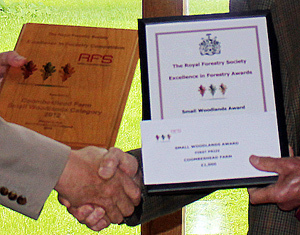 As seen in the photo (featured above), Richard Scholfield of Woodlands.co.uk had the honour of handing out the awards. Richard said: “Caring owners of small woodlands add hugely to the quality of our nation’s woodland by increasing and preserving the rich biodiversity we all value so much. Woodands.co.uk would like to thank all those who entered the competition. The field was very strong, reflecting what is a relatively recent change in the pattern of woodland ownership, with now increasing numbers of owners looking after their own woods. 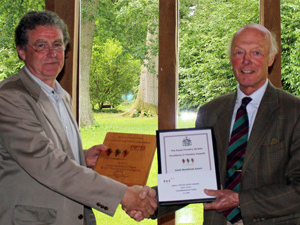 Caring for a woodland is a reward in itself but getting recognition from these awards is an additional reward".